Plotinus (204-270 AD) was the most influential figure amongst the Neo-Platonists – the “Eclectic Philosophical School” founded by Ammonius Saccas. They were the first to call themselves “Theosophists” and were also known as “Philaletheans”, meaning “Lovers of Truth” and “Analogeticists,” because of their emphasis on the law of correspondence and analogy in spiritual and philosophical teachings. It should be understood, however, that neither Ammonius Saccas, Plotinus, or their followers ever actually referred to themselves as “Neo-Platonists” or to their teachings as “Neo-Platonism.” This term was coined over a thousand years later by scholars as a convenient means by which to describe and identify them. 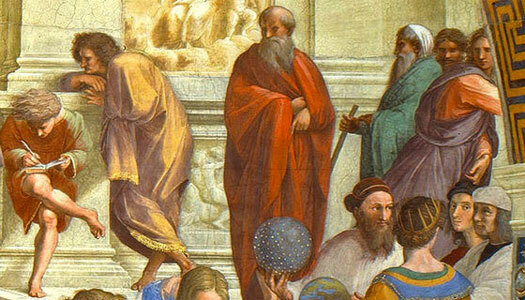 The leading lights of Neo-Platonism were certainly initiates of the Esoteric Doctrine, the Sacred Science known as the Theosophia – “Divine Wisdom.” Neo-Platonism was, according to HPB, the last attempt in that era by the Great Brotherhood to present the TRUTH in the midst of – and as an opposing force to – all the falsehood and fraud of the young Christian Church. Some of the most well known and influential Neo-Platonists after Ammonius Saccas and Plotinus were Porphry, Iamblichus, Proclus, Cassius Longinus, and the young female philosopher Hypatia. The brutal murder in the 5th century AD of Hypatia – “soon become an unrecognizable mass of flesh and blood, pounded to jelly under the blows of the club of Peter the Reader … her youthful, innocent body cut to pieces, “the flesh scraped from the bones,” by oyster-shells and the rest of her cast into the fire, by order of the same Bishop Cyril” – marked the setting of the sun of Neo-Platonism and the beginning of the Dark Ages, a period in which the majority of the Western world was plunged into mental and spiritual darkness through the enforcement of ignorance, falsehood, and fear by the Christian Church, which today reveres the man who orchestrated Hypatia’s murder (and who was also a proven thief and fraud) as one of the first and greatest “Saints” of Christianity. Take, then, an ugly soul. It is dissolute, unjust, teeming with lusts, torn by inner discord, beset by craven fears and petty envies. It thinks indeed. But it thinks only of the perishable and the base. In everything perverse, friend to filthy pleasures, it lives a life abandoned to bodily sensation and enjoys its depravity. Ought we not say that this ugliness has come to it as an evil from without, soiling it, rendering it filthy, “encumbering it” with turpitude of every sort, so that it no longer has an activity or a sensation that is clean? For the life it leads is dark with evil, sunk in manifold death. It sees no longer what the soul should see. It can no longer rest within itself but is forever being dragged towards the external, the lower, the dark. It is a filthy thing, I say, borne every which way by the allurement of objects of sense, branded by the bodily, always immersed in matter and sucking matter into itself. In its trafficking with the unworthy it has bartered its Idea for a nature foreign to itself. If someone is immersed in mire or daubed with mud, his native comeliness disappears; all one sees is the mire and mud with which he is covered. Ugliness is due to the alien matter that encrusts him. If he would be attractive once more, he has to wash himself, get clean again, make himself what he was before. Thus we would be right in saying that ugliness of soul comes from its mingling with, fusion with, collapse into the bodily and material: the soul is ugly when it is not purely itself. It is the same as with gold that is mixed with earthy particles. If they are worked out, the gold is left and it is beautiful; separated from all that is foreign to it, it is gold with gold alone. So also the soul. Separated from the desires that come to it from the body with which it has all too close a union, cleansed of the passions, washed clean of all that embodiment has daubed it with, withdrawn into itself again – at that moment the ugliness, which is foreign to the soul, vanishes. “How can one see the beauty of a good soul?” Withdraw into yourself and look. If you do not as yet see beauty within you, do as does the sculptor of a statue that is to be beautified: he cuts away here, he smoothes it there, he makes this line lighter, this other one purer, until he disengages beautiful lineaments in the marble. Do you this, too. Cut away all that is excessive, straighten all that is crooked, bring light to all that is overcast, labor to make all one radiance of beauty. Never cease “working at the statue” until there shines out upon you from it the divine sheen of virtue, until you see perfect “goodness firmly established in stainless shrine.” Have you become like this? Do you see yourself, abiding within yourself, in pure solitude? Does nothing now remain to shatter that interior unity, nor anything external cling to your authentic self? Are you entirely that sole true light which is not contained by space, not confined to any circumscribed form, not diffused as something without term, but ever unmeasurable as something greater than all measure and something more than all quantity? Do you see yourself in this state? Then you have become vision itself. Be of good heart. Remaining here you have ascended aloft. You need a guide no longer. Strain and see. Only the mind’s eye can contemplate this mighty beauty. But if it comes to contemplation purblind with vice, impure, weak, without the strength to look upon brilliant objects, it then sees nothing even if it is placed in the presence of an object that can be seen. … Let each one therefore become godlike and beautiful who would contemplate the divine and beautiful. You may also like to read Plotinus on The ONE Supreme Reality, Plato and Aristotle, Dismantling the Christian Edifice, Theosophy: The Ancient Wisdom, 12 Things Theosophy Teaches, and How to successfully study the Teachings of H.P. Blavatsky.